In case you haven’t realized, the Google Android Device Manager has been live for a couple of weeks now and it just gained a brand new feature, allowing you to remotely lock your device. At launch, Android Device Manager only allowed users to track, ring or erase (permission must be given on the device itself before users are allowed to remotely wipe out their Android phone) their Android device(s), but starting today, the company introduced this new feature, giving users a slightly better control over their Android phones and tablets. You know how you’ve just misplaced your device, you’re pretty sure that you can still get it back but wish to lock it just in case, or if you’re out of the office and you left your unlocked device there with all your accounts logged in? A remote locking feature would be the perfect tool to use in such scenarios. Once locked with a password, the phone will require a password to be unlocked and if you do not wish to use it, you’ll need to manually turn off the security feature in your phone itself. Here’ something to note, it will overwrite your existing security feature – face unlock, code unlock, pattern unlock, etc. with the new password. Of course, such security feature is nothing new, it’s been available on Apple devices for the longest time, Sony introduced a “My Xperia” remote app that does pretty much the same things as this, but it definitely is great to know that Android has its own official version that requires no installation. 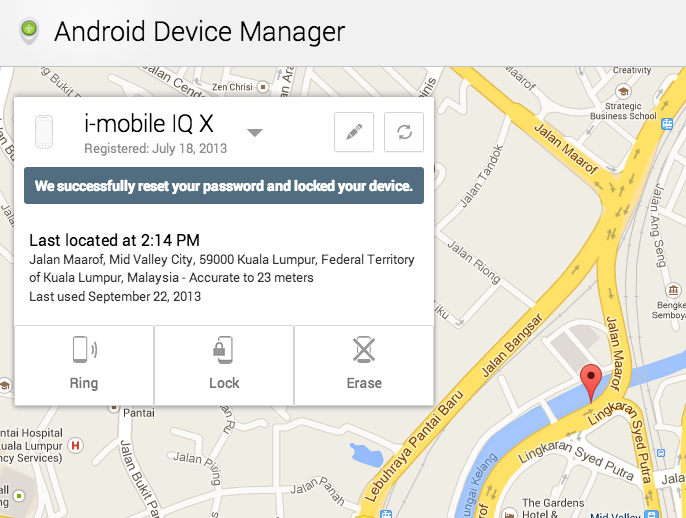 Visit Android Device Manager now for more information.